Lyrics from Better Beautiful Than Perfect by Roger Clyne and the Peacemakers on the Sonoran Hope & Madness CD. So Saturday night, after dinner and a couple of games of pool, we headed to the Gothic Theatre, just as the doors were opening. Altough there was a line to get in, the guys managed to get right in. Because we had to be patted down before entering my sister and I had to go to the back of the line and wait for a woman. But the guys were in and secured good seats and we didnt’ have to wait long. I can not tell you how much I love this band. I was first introduced to them when I moved to Arizona in 1999. The lead singer, Roger Clyne and the drummer, P.H. Naffah used to be part of a band called The Refreshments , which had one song on the radio that you may have heard. I don’t know how many times I’ve seen RCPM preform, but they are always great. Their sound is tight, they are so into the music and their fans. I think you’d be hard pressed to find a band who loves their fans as much and who’s fans are so rabidly loyal to them. Last Saturday night, I was not dissapointed. After two opening bands (Chocolate Fountain and As Fast As, who were great) RCPM took the stage to play for two hours. They did it with enthusiam and appreciation for everyone there, of course the usual tequila shots were passed to Roger during the show, I swear I don’t know how that man continues to play let alone walk off the stage. The pictures aren’t great, but we were lucky enough to get some great seats on the balcony for the show (thanks Kevin!). The view and the sound were great. The Gothic Theatre has a great sound system. The venue was small enough no one was too far from the band. I also managed to get some video of the band, but WordPress does not like Youtube so here are the links. The sound isn’t great as it was very loud in there and my digital camera couldn’t handle it so it’s distorted. But I’m proud of them and I did manage to get song from their new, not yet released album. Dont’ Wanna Know, Teenage Wasteland – Who cover, Undelae (spelling?) their new song. If you’ve never heard them or of them, I highly recommend them, one of their cds now! Day two we headed up to Oak Creek for a concert that Kevin’s new band, Jebus, was playing in. Oak Creek is a small town up higher in the mountains than Steamboat. Jebus jamming with Cat in the Hat, who did some very cool freestyle. I got some short video clips so check them out. Last night I want to Columbia to see Kevin's old band, Nine Below Zero, play together one last time. The singer didn't show up, but the rest of them decided to just jam. They were just getting into it when it started to rain so the show was over. They always attract an interesting crowd and last night was no different. 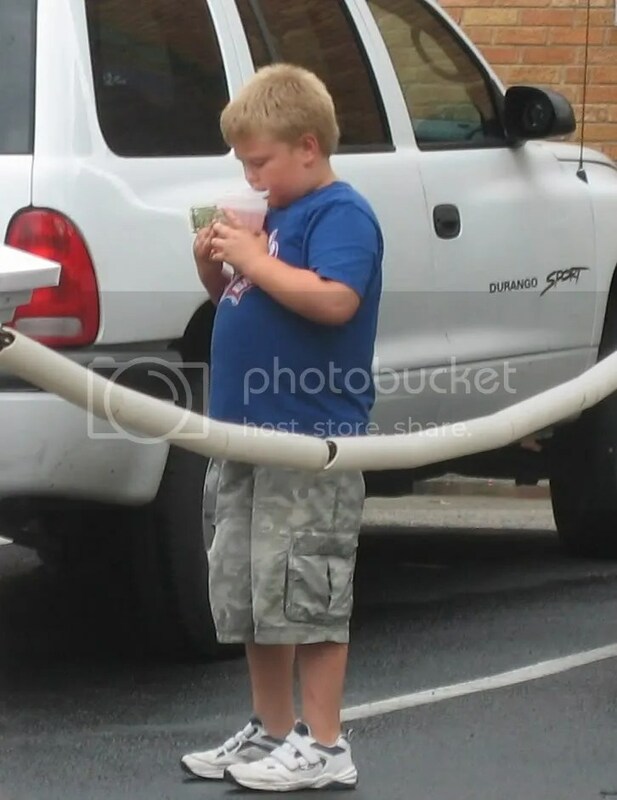 Out of no where this little fat kid shows up with a fist full of dollars. I couldn't be sure if he was a connoisseur of the arts or just obnoxious. 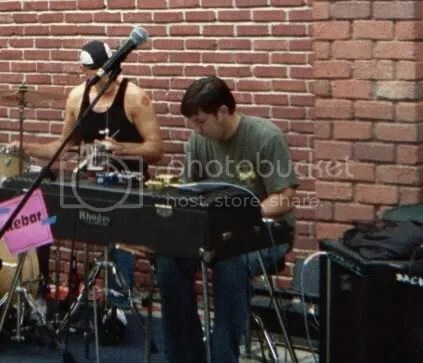 When he put the first dollar in the tip jar he told the band "Here's something to get you started" Later he also told them he'd give them a dollar for every song they played. He still had several dollars in his hand when the show was cut short I wonder just how much he would have put in that tip jar? It’s been a busy busy weekend. Thursday night I watched Kevin’s band – Rebar play at the Colesseum in Columbia. They were outside so we worried about rain but it ended up being perfect weather for a show. George hung out with me while the band played and Natasha and Qhyrrae stopped by after it was over. It was nice to hang out and talk to everyone outside of work. Friday Kevin mowed the yard while I tarred the roof. Then off to Paddy’s as usual. Saturday I got to work on the house and mowing the back yard. We also watched a couple of movies and I did some knitting. The short scoop on the movies we watched this week: all of them are out on DVD. Shopgirl – I liked it, I recommend it. Capote – I thought I would be annoyed by the way Phillip Seymour Hoffman talked but I wasn’t. The acting was good and so was the cinematography, I definitely recommend it and now I need to see In Cold Blood . Proof – it came out a while ago and I wondered why I hadn’t seen it since it stars Gwyneth Paltrow, Jake Gyllenhaal, and Anthony Hopkins, now I know. It was ok, but I can’t really recommend it. Today I’m working around the house. I’ll be posting more about the house later this week. I checked out Mason-Dixon Knitting from the library and I’ve decided to go back to basics for a while. I’m using up some of my cotton yarns to make wash clothes and practice my stitches. Here’s one using the pattern in the book. I know the colors aren’t the “perfect” coordinate choice, but yeah, they are just wash clothes. My next project a hand towel pattern in the book. I ordered some Euroflax Original Linen to make a couple of hand towels. I can’t wait until it gets here! FYI – Rebar, a band Kevin plays with will perform at the Twilight Fest in Columbia on June 1st and 15th from 6-8 pm at the Colosseum at 402 Broadway. I'll be there the whole time so feel free to come for the whole thing or stop by for a while. This is the new band, they've done a couple of open mics with really good response. I like the sound and think they sound great so I recommend coming by! My favorite band is Roger Clyne and the Peacemakers, I got into them when I was in AZ and I was able to see them all the time. But now that I’m back in the Midwest they don’t come through this way very often. In June they are going to be at a big music festival called Wakarusa in Lawrence Kansas. I thought about going but decided that after two days of sitting in the sun and sleeping in a tent, I would not be happy-Bobbi, I would be sunburnt-bugbitten-dehydrated-hungover-bitchy-Bobbi, so this might not be as much fun as it first seemed. Instead I opted to take the same time and visit my sister in Denver. Puv is going with me, we’ve all arranged to take the time off work. Its going to be a lot of fun, I’m really looking forward to it. Then today I find out, the Peacemakers are playing in St. Louis on Tuesday June 13th!!!!!! That’s the day we’re coming back. Why can’t they be playing in Kansas City? That way we could stop on the way through. I realize this seems small, but they are my favorite band and they only play here maybe once a year, plus I’ve been having the worst run of luck lately and this just seems par for the course. Nathan assures me it has nothing to do with karma, but I’m not sure I believe him anymore. I think it may be time to start sacrificing chickens.